Column: Why do so many American families feel so financially insecure? Editor’s Note: Would you prefer financial stability or economic mobility? The story of the American Dream in the United States has always been one about mobility. But in 2014, when the Pew Charitable Trusts asked this question to 7,000 Americans, 92 percent chose stability. Why is this happening, and why are so many Americans still feeling so financially insecure — almost eight years after the Great Recession? In the U.S. Financial Diaries study, economists Jonathan Morduch and Rachel Schneider followed 235 low- and moderate-income households for a full year to understand why. 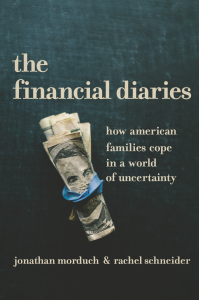 Their new book “The Financial Diaries: How American Families Cope in a World of Uncertainty,” presents their findings, revealing true American stories and identifying policy-based solutions. The following is an excerpt from their book, on sale April 11. The afternoon was perfect — 75 degrees and clear, not too hot and not too cold. But Becky Moore was complaining about the weather. This was the kind of weather she said was “killer” on her husband Jeremy’s paycheck. Jeremy, 38, worked full time as a mechanic, repairing long-haul trucks on the evening shift at a service center on the interstate north of their Ohio town, earning a commission for each truck he fixed. Their children were still at school when Jeremy — usually dressed in a pair of Levi’s, a western shirt and steel-toed boots — pulled his pickup out of the driveway to get to work by 2 pm. The children, and sometimes Becky, were fast asleep by the time Jeremy got back after midnight. Jeremy’s biggest paychecks came during the hot weeks of summer, when the tar bubbles on the roads and the pavement is too hot to walk on with bare feet. The heat burns out truck tires, and Jeremy spent most of his summer shifts patching them. Icy chills weaken batteries and alternators, and the winter months brought big paychecks too. But during the fall and spring, Jeremy’s take-home pay could be as low as $600 for two weeks of full-time work. The mechanics on the day shift kept busier, and Jeremy complained that there often wasn’t much left to do when he arrived at 2. Some mild-weather days, Jeremy had only one truck to work on during his entire eight-hour shift. For Becky, 34, the uncertainty of that weighed heavily, and it was only October. “I’m thinking that two weeks from now it will be crap,” she said, imagining Jeremy’s next paycheck. For Jeremy, having a full-time job did not mean having a steady income. Like many of their friends, and a third of Ohio adults, neither Jeremy nor Becky has more than a high school diploma. But finishing high school used to be enough to land a solid factory job in southwest Ohio, one that came with guaranteed pay, benefits and a pension. General Motors had built cars in Norwood, about an hour away, since 1923, and for decades Norwood proudly turned out Camaros and Firebirds, America’s muscle cars. When Jeremy was 12, though, GM shut the Norwood plant along with 10 others across the country, citing high costs and foreign competition. It’s now more than a decade since Procter and Gamble closed the local plants that made Tide detergent, Crisco shortening, Crest toothpaste, Secret deodorant and Head & Shoulders shampoo. This is not just an Ohio story. 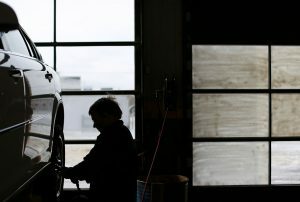 In August 1987, the month the last Camaro rolled off the Norwood line, about 18 percent of Americans nationwide worked in manufacturing. Since then, the percentage has been halved, as has the rate of union membership. Office jobs and clerical jobs have given way to automation too, part of America’s shift toward a service economy. Fixing trucks on commission means that Jeremy, and not just his employer, bears the risks of weather, slow days and business ups and downs. In the heat of July, Jeremy took home $3,400 after taxes—in March he took home about half that, $1,800. Now, October was threatening to be as bad as March. While the kids were at school, Becky also volunteered at a local animal shelter and sometimes worked cleaning neighbors’ houses. Most of the family budgeting fell to her, and her large green wallet was stuffed with receipts. Given the uncertainties of Jeremy’s paychecks, Becky wasn’t sure whether to pay her mortgage yet. The payment was not due for three weeks, but Becky already had the money in hand. Still, she was wavering. “I want to make sure I have enough money on hand, and I don’t know what my husband will bring home this paycheck.” She started talking herself into writing the check: “I just want to get it done.” But then she decided to wait. Becky knew her bank account was almost empty. If she spent her remaining cash on the mortgage and Jeremy’s next paycheck turned out to be as small as she feared, she would have to borrow from her older sister to make ends meet. Becky had borrowed $200 from her not long before when Jeremy’s paycheck was short and they had needed gas for their minivan. “That right there was $75 alone,” she said. The story often told about financial success in America is that slow and steady saving over a lifetime, combined with consistent hard work and a little luck, will ensure financial security, a comfortable retirement and better opportunities for one’s children. But that is not Becky and Jeremy Moore’s experience. The 2016 elections brought to the fore how frustrated so many Americans are about the fact that this is no longer, or never was, their experience either. Without basic economic stability, their choices are often difficult, and they’re forced to make them frequently. Short-term imperatives undermine long-term goals. The often-told story is rooted in a world in which the norm is to gain education, move to better jobs, reach peak income in middle age and then retire. Researchers call this basic arc the “life cycle,” and it captures the life stages for which teachers and financial educators try to prepare students. The idea underpins nearly all advice on managing wealth and how families should save and invest over time. It is the backbone of the life-cycle theory of saving, a framework so fundamental to economics that in 1985 the Nobel Memorial Prize in Economics was awarded to Franco Modigliani, the MIT professor who elaborated its consequences for families’ financial choices. The advice to young families like that of Becky and Jeremy is to prepare for major life events early on: to start saving for a down payment on a house and to begin steadily saving for retirement. Later, as earnings rise, people should pay down their mortgages and set aside more for retirement. In this world, slow, steady, disciplined adherence to a budget and savings plan promises to conquer financial challenges. In the past 50 years, mastering the stages of the life cycle has become synonymous with being financially literate in America. And helping families achieve life-cycle goals drives hundreds of billions of dollars of government support for housing, education and retirement. Assuming that everyone can follow this trajectory is dangerous. Becky and Jeremy don’t have the luxury to focus much on long-term plans. Without basic economic stability, their choices are often difficult, and they’re forced to make them frequently. Short-term imperatives undermine long-term goals. Saving and borrowing need to be recalibrated with the spikes and dips of their income. The consequences of bad decisions can compound, and quickly. Stress and anxiety make it all harder. Seeing that, it’s hard not to question basic assumptions about financial literacy and what governments and businesses should be doing to serve working families. Even if Becky and Jeremy were expert financial planners trained in the life-cycle model, they still would have found it nearly impossible to follow its prescriptions. In the past, Jeremy would contribute part of each paycheck to a 401(k) retirement plan, hoping he could keep it invested. Each time Jeremy switched jobs, however, he pulled all their money from the retirement plan, even though that meant extra taxes and penalties for early withdrawal. They simply needed the money sooner than at age 65. Becky and Jeremy are in a position that’s increasingly common in America. Why are so many families forced to make such costly — and some might say self-destructive — choices? Why do so many families feel so financially insecure? 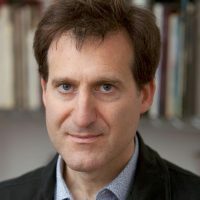 Jonathan Morduch is Professor of Public Policy and Economics at the Wagner Graduate School of Public Service at New York University, as well as a founder and Executive Director of the NYU Financial Access Initiative. He is co-author of "The Financial Diaries: How American Families Cope in a World of Uncertainty." Rachel Schneider is senior vice president at the Center for Financial Services Innovation, an organization dedicated to improving the financial health of Americans. 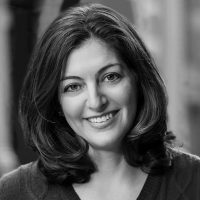 She is co-author of "The Financial Diaries: How American Families Cope in a World of Uncertainty."